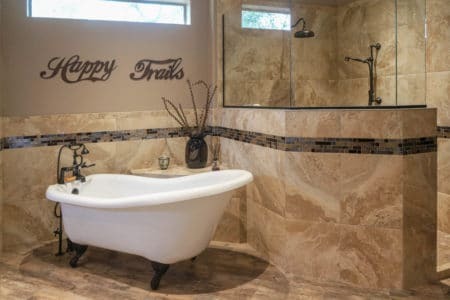 If you are looking for a bathroom and kitchen remodeling contractor that you can trust for beautiful design and exceptional craftsmanship, then you have come to the right place. Premier Kitchen & Bath is an acclaimed remodeling firm that has been serving homeowners in Phoenix, Arizona, and surrounding communities since 1994. Our longevity speaks to our ability as a remodeler, as do many of our awards and ratings, such as the multiple Best of Houzz awards we’ve attained, our A+ rating with the Better Business Bureau, and our status as a Top 500 Remodeler with Qualified Remodeler. Discover – During a free, in-showroom consultation, we’ll discuss your remodeling project, get to know one another, and determine if we are the right fit. Design and planning – After we’ve decided that we’re the right fit for one another, we’ll move into the design and planning phase, during which your remodeling dreams will begin to come to life. Refine – We’ll revise your design as needed to ensure it’s exactly the way you want it. Once you’re completely satisfied with your design, we’ll order all the required products and materials and store them in a local warehouse until construction begins. Build – Once everything is in place and all products and materials have been delivered, our craftsmen will complete your remodel to the very highest standards. Visit or contact Premier Kitchen & Bath today to learn more about why we’re one of the most sought-after bathroom and kitchen remodeling contractors serving Phoenix, AZ, and surrounding areas.